The 2014 scholarship winners were announced at the 2014 Centennial Convention in Harrisburg, PA.
Anthony Carfang Award ($3,000) - Established by 36th National President and Centennial Chairman, Anthony Carfang. Anthony has served for over thirty-five consecutive years as a Scholarship Trustee and a Foundation Director. He is the all-time leading financial donor to The Alpha Phi Delta Foundation. Natalie attends the Loyola University School of Medicine in Chicago. She was graduated from The University of Pittsburgh with a double major in Biology and History where she attained a GPA of 3.80. She is a well-rounded individual who has interned at a museum in Paris, where she became proficient in French, performed in Community Theater for the last twelve years, and conducted research on muscle degeneration at the University of Pittsburgh. Natalie has vowed to use her experiences dealing with her late father’s illness to make her a better physician. Her application is enthusiastically supported by her uncle, Florida area alumnus, Jack Consiglio. 4.0 Grade Point Average at Gannon University where he is a member of the Beta Rho chapter. Keith is majoring in Mechanical Engineering. He is a member of the Scholars of Excellence in Engineering and Computer Science, which is currently working on a project with Habitat for Humanity to design a more adequate and efficient airflow through the organization’s standard-design homes. Keith also serves as Secretary on the Student Advisor Board, a group that reviews the curriculum of the school’s Honors Program. 3.95 Grade Point Average at Duquesne University where she is studying Early Childhood Education. She is the granddaughter of Anthony Scotti, an alumnus from The University of Pittsburgh. 3.9 Grade Point Average at Penn State University where he majors in Biomedical Engineering. He plans on attending medical school upon graduation. He is the son of Psi Alumnus Mark Belsky. 3.73 Grand Point Average at St. John’s University, Staten Island where he is Treasurer of the Gamma Sigma chapter. Michael is a member of the school’s President Society, a position that is considered to be the highest student honor. He is also participating in the Panama Plunge, a two week service trip offered by the university. 3.81 Grade Point Average at Youngstown State University where he is Biology major and a pre-med student. Dylan has served as the Fundraising and Philanthropy Chairman and President of Beta Omicron Chapter and IFC Vice President. He is the son of Youngstown Alumni Club President Danny Thomas, Jr.
3.96 Grade Point Average at Robert Morris University where he is a member of Delta Upsilon Chapter. Chad is majoring in Actuarial Science and Finance. He is the Community Service Chair for his chapter and is one of the founders of the reactivation colony at Robert Morris University. John J. Hadgkiss Centennial Scholarship ($1,000) - Funded by the first Centennial gift pledge - a commitment to donate every year through the 2014 Centennial celebration - by Beta Rho alumnus John Hadgkiss, who has served Alpha Phi Delta in many positions including Scholarship Trustee and Foundation Executive Director. 3.87 Grade Point Average at Robert Morris University where he is a member of the Delta Upsilon Chapter. Aaron is double majoring in Accounting and Finance. He serves as the chapter’s representative in both the Student Government Association as well as the Interfraternity Council. Aaron is also one of the founding brothers of the reactivation colony at Robert Morris University. 4.0 Grade Point Average at Arizona State University where she is a Classical Language and Philosophy double major. Jenna is the Campus Campaign Coordinator and Operations Coordinator for the Teach for America branch in Tempe, Arizona. Jenna is also the niece of Raymo Santilli, member of Psi Chapter. 3.77 Grade Point Average at St Joseph’s College where he is an Accounting major. Marco plays on the school’s NCAA Division III Soccer team and is a member of the NCAA All-Academic Team. He has served as chapter Secretary and Treasurer. Paul J Sciullo II Memorial Award ($1,000) - An American hero, brother Paul was killed in the line of duty on April 4, 2009 after only two years on the City of Pittsburgh Police Force. He played varsity hockey and golf at Duquesne where he was a member of Psi Chapter. Paul became a police officer at age 35 telling his mother he was leaving more lucrative employment in the private sector, because he wanted to “make a difference.” Alpha Phi Delta is honored to be forever associated with his memory through this scholarship. Angela attained a 3.94 Grade Point Average at The University of Pittsburgh where she received her undergraduate degree in Communication Science. She is pursuing her Doctorate at the University in Audiology this year. Angela is the daughter of Kleos Editor John Russo. Brother Santo served as National President from 1978 to 1980. In addition, he had served as District Governor and editor of the Kleos. But his tenure as a trustee of the Alpha Phi Delta Scholarship Foundation is really quite significant as he served from its founding in 1974 until his death in 2012. In the near 100 year history of our fraternity no one has, nor likely will, serve our brotherhood in an official capacity for 38 years! Attained a 2.90 Grade Point Average at St. Joseph’s College, Long Island where he is a member of the Epsilon Gamma Chapter. Samuel currently serves as the president of his Chapter. He will serve as the National Vice-President for Undergraduate Affairs for the 2014-2015 year. 3.40 Grade Point Average at Duquesne University as a member of the Psi Chapter. Matthew is a Supply Chain Management and Information Systems double major. He served as the Psi Chapter President and was head of the National Convention Committee at Duquesne in 2014. Anthony Sallo Award ($500)- A beloved member of Alpha Phi Delta. This scholarship was established by his many friends in the fraternity after his passing in 2014. Anthony was graduated from Duquesne University, where he was a member of Psi Chapter. He became a teacher and later an educational psychologist in the Pittsburgh school system. 3.60 Grade Point Average at the University of Delaware. Nicole is currently an English major and participates in UDRESS, a fashion magazine on the school’s campus. She is the granddaughter of Francis Prezioso, a member of Psi Chapter. 3.55 Grand Point Average at Baruch College. Jonathan is a Political Science and Spanish double major. He is the president of the Gamma Rho Chapter. Jonathan also serves as the Vice President of the Inter-Greek Council on campus. Frank Cavallaro Award ($500) - Established in honor of the 22nd National President and longtime expansion chairman Frank Cavallaro. 3.70 Grade Point Average she is the Granddaughter of Robert Rini a member of Eta Chapter at The City College of New York Class of 1951. Alexandra is a Public Relations and Marketing major at Jacksonville State University in Alabama. 3.89 Grade Point Average at Duquesne University. Joseph is a Supply Chain Management major. He is currently the Vice President of the chapter. Joseph will be a student representative on the school’s Judicial Board for this upcoming academic year. 3.76 Grade Point Average at Robert Morris University. Charles is a Finance major with a minor in Computer Information systems. He has served as the Secretary and Vice President of the Delta Upsilon chapter. 3.71 Grade Point Average as a Software Engineering major. Derek is a member of the Delta Upsilon chapter He is as a member of the Ultimate Frisbee Team and the Association for Computing Machinery. 3.70 Grade Point Average as a Health Management Systems major. Josh is a member of the “Rotoract” Service Organization set up by Alpha Phi Delta, which will be taking a service trip to Honduras next spring. Adam DiVincenzo Award ($500) - Established in honor of the 21st Grand Consul and longtime National Secretary. Adam will always be remembered by his many friends as "Mr. Alpha Phi Delta". 3.51 Grade Point Average at Harvard College as a Physics and Computer Science double major. Joseph served with the Learning Garden, an organization that taught students how to build eco-friendly gardens in their schools. His uncle is John Schiavone, a member of the Delta chapter. 3.69 Grade Point Average as a Mathematics major. Christopher is a member of Psi chapter. He plans to attend graduate schools to receive a Masters’ degree in Mathematics. 3.42 Grade Point Average at St. Joseph’s College, Long Island Campus where he is a member of the Epsilon Gamma Chapter. Raymond is a History and Political Science double major. He will serve as Treasurer of the Student Government Association and President of Greek council on Campus. Raymond also serves as the Delegate for the National Council as a representative for the Epsilon Gamma Chapter. 3.15 Grade Point Average at St. Francis University where he is also a member of the Beta Lambda chapter. Timothy is a Criminal Justice major and served as Chairman of the Judicial Committee. He hopes to start a Ms. Purp Pageant and Color Run 5k on campus this upcoming academic year. 3.72 Grade Point Average as an Industrial Design major at Philadelphia University. Maria is the sister of Joseph Cipolla, a member of Beta Beta Chapter. 3.67 Grade Point Average at Fordham University where she is a Criminal Justice major. Amanda is the sister-in-law of Past National President Nicholas Franki. 3.61 Grade Point Average as a Journalism and Communication double major. Tony is a member of the Theta Beta Chapter. He is also the Senior Editor of Washington Square News published by New York University. 3.61 Grade Point Average at Molloy College. Nicole is a Childhood Education and Special Education for Math double major. She is the daughter of Michael DiBlasio, member of Beta Eta Chapter at Brooklyn College. 3.85 G.P.A. in Interior Design at Kean University. She is the daughter of Past National President Al Fafara, Jr.
3.65 Grade Point Average as a doctoral student at Dowling College. Benedict is currently pursuing a Doctor of Education Degree in Educational Administration. He is also a member of the Epsilon Gamma Chapter. 3.80 Grade Point Average at The University of Arizona where she majors in Musical Theatre. She is the granddaughter of Pittsburgh Alumni Club member Anthony Iole. 3.70 Grade Point Average at Gannon University. Bryan is a member of the Beta Rho chapter. He is studying for his doctorate in Physical Therapy. Richard Primiano Award ($500) - Established by the 38th National President and longtime Scholarship Fund Treasurer. 3.70 Grade Point Average. 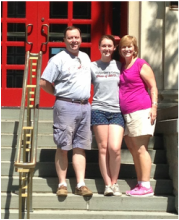 Christine is the daughter of Stephen Phelan, an alumnus of Beta Sigma Chapter at St. Francis College. 3.14 Grade Point Average at Duquesne University where he is a member of Psi Chapter. Matthew is a Supply Chain Management major. He was also the founder of the Rotoract and Pure Thirst organizations on campus. 3.98 Grade Point Average at Penn State University where he is majoring in Integrated Science and is seeking an MBA degree. 3.46 Grade Point Average at Pace University, Pleasantville Campus. Joseph is an Accounting Major and a member of Gamma Iota Chapter. 3.70 Grade Point Average at Northeastern University where she is a Speech-Language Pathology/Audiology major. Rachel is the niece of James Salamy, an alumnus of Beta Iota Chapter at Utica College. 3.36 Grade Point Average at SUNY College at Oneonta where he is a member of the Delta Rho Chapter. Brendan is a Computer Science major. 3.09 Grade Point Average at St. John’s University, Staten Island Campus. Charles is a Communications major and also a member of the Gamma Sigma Chapter. Youngstown Alumni Club Donald “Red” Nolfi Award ($500) - Established by the Youngstown Alumni Club in honor of Red Nolfi, the first Beta Omicron Chapter President and a guiding force for area alumni. 3.65 Grade Point Average at Youngstown State University where he is an Industrial and Systems Engineering major. David has served as the Historian and Secretary for Beta Omicron Chapter.